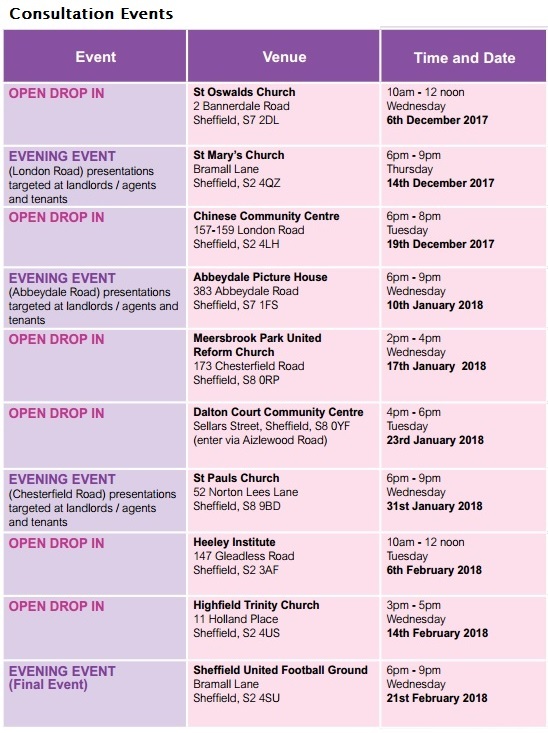 We ran a consultation between Monday 27th November 2017 and Friday 23rd February 2018 to seek opinions on our proposals for introducing Selective Licensing of private rented properties on London Road, Abbeydale Road and Chesterfield Road. We ran four questionnaires (available online and on paper), separately targeted at tenants/residents, landlords and businesses in the area where Selective Licensing is proposed and also residents and businesses in the surrounding area. We also held a series of ten events open to the public to come and have their say. We received a total of 872 completed questionnaires and these and the other responses we received, at the public meetings, by email, and formal submissions, have been written up into a Consultation Report which can be read on the Council’s website – www.sheffield.gov.uk/selectivelicensing. The responses we received to the questions in the questionnaires are summarised in the Report. We are proposing to proceed with Selective Licensing but in direct response to the consultation and evidence gathered by the service a new, reduced designation area is being proposed and changes have been proposed to the fee structure. The proposals go to the Council’s Cabinet on the 20th June, with the scheme to start 1st November 2018. Details on the proposals can be read in the Cabinet Report which is available here. To check if you are in the proposed Selective Licensing area, or in the Wider Consultation Area, check the maps and address lists available at the bottom of this page.